Who doesn't love a Cosmopolitan? Unfortunately most versions of this sugary cocktail can cost you about 300 calories. The good thing about a Cosmo, is that you really don't need all the sugar to make it tasty. 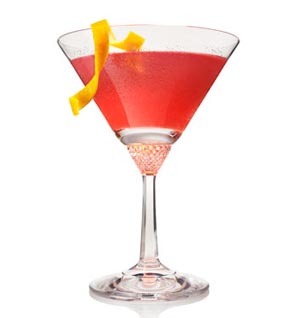 Try Self Magazine's Skinny Cosmopolitan Recipe for a delicious 100 calories Cosmopolitan. This is also a great drink to make for a Holiday Party, the red coloring and cranberry flavor can really get you in the Christmas Spirit! Combine all ingredients, (except for the orange zest for garnish) into a hand mixer. Shake until blended and cold. Pour into 4 martini glasses and garnish with orange zest.